We’ve recently released some new changes which will provide more tracking options for everyone but may be of particular note to those of you with a WhereDial to update. The first thing to mention is our improved Latitude support. We are now plugging directly into the official Google Latitude API, rather than using their “Badge” API. This means that you can link your latitude account to MapMe.At without having to make your location public to anyone else. Google Latitude is a great way to track your location passively. Running in the background on Android and iPhone devices, Latitude will keep an eye on your location and let MapMe.At know when it changes. It does this intelligently too, using your device’s lower power systems to detect when the location has changed rather than running the GPS continuously. With the Google Latitude API support we’ve also introduced some new attributes into logged locations: altitude, horizontal accuracy and vertical accuracy. We have also added functionality that means if someone provides us with a new location for you which has no place information but is very close to your previous check-in which did have a place attached, we will re-use that place information. There’s more technical information below but these changes should help to give you a cleaner trace with fewer instances of you bouncing between a place and an anonymous location as different services provide a location for you. The final thing we wanted to mention is our mobile site, https://mapme.at/me/mobile. We don’t talk about it very much but this has been around for a while now and gives you a handy way to check-in to places near to where you last checked in or, if your device can provide a location, near to where you are now. Your nearby favourite places will appear at the top with other places appearing further down, closest first. It will even check you in automatically. If you select the second checkbox then once your device gets a location with an accuracy of less than 50 metres it will check you in. 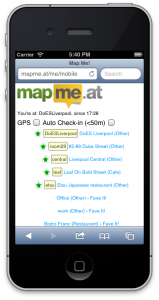 As ever MapMe.At will try to find a favourite place nearby or just store your anonymous location if necessary. If you leave this running while travelling it’s a great way to get a continuous trace with a little more accuracy than Google Latitude will provide. We hope you enjoy these changes, let us know via twitter or Get Satisfaction if you have any problems. Read on for some more technical details. Before we made these changes we often found that our history could be “broken up” by locations provided by multiple services. For instance checking into Foursquare with a “shout” can result in a geo-tagged tweet. This could mean that your history would show a check-in to your favourite art gallery followed straight away by an anonymous location being logged moments later as the tweet would not be linked to the Foursquare check-in. The new changes mean that your tweet’s location would be detected as close enough to your previous check-in to be at the same location and the place information would be copied across. 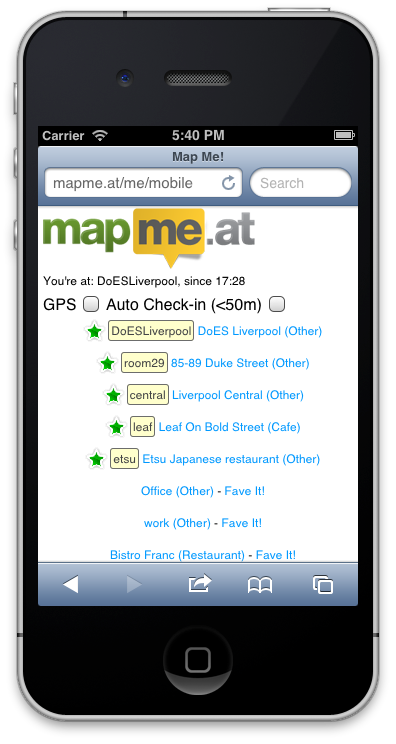 Note that this will only occur for a new check in and be compared to what MapMe.At thinks your current location is. Unfortunately right now it would be too intensive to check with historical check-ins. We’re using the new horizontal accuracy information to define how close is close enough. Some services will provide locations with less accuracy, e.g. 5000m. This may seem useless however if it’s your first location in a new country then you will probably want to log the visit to a new country and be less concerned about the inaccuracy of the location. However if you haven’t really moved you obviously don’t want MapMe.At to think you are no longer at home, for instance, just because it has received an inaccurate check-in. If the service that we get the location from gives us accuracy information then we will use this to define how close your previous check-in needs to be. We’re only doing this with Google Latitude right now but we will extend it to other services in the future.